The spectral tau method was originally proposed by Lanczos for the solution of linear differential problems with polynomial coefficients. 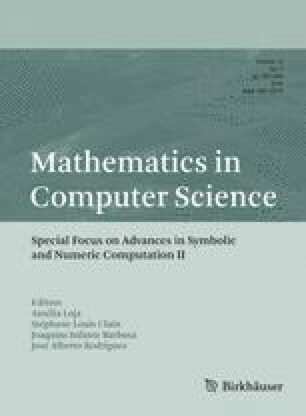 In this contribution we present three approaches to tackle integro-differential equations with non-polynomial coefficients: (i) making use of functions of matrices, (ii) applying orthogonal interpolation and (iii) solving auxiliary differential problems by the tau method itself. These approaches are part of the Tau Toolbox efforts for deploying a numerical library for the solution of integro-differential problems. Numerical experiments illustrate the use of all these polynomial approximations in the context of the tau method. The first author was supported by CAPES, Coordination of Superior Level Staff Improvement—Brazil. The second and third authors were partially supported by CMUP (UID/MAT/00144/2013), which is funded by FCT (Portugal) with national (MEC) and European structural funds through the programs FEDER, under the partnership agreement PT2020. The authors acknowledge support from Acordo de Cooperação Internacional I&D USP/U.Porto 2015.